Written on December 12, 2008, and categorized as Flip side. It was a great moment for me today as I watched the short video from the European Podcast Awards (below) and saw that Pod of Funk had won in the category for Personality, British section. This actually means more to me than judging the Sony Awards, and although I am proud of the fact that I helped to establish podcasting at the heart of UK media institutions, to be honoured by my peers (and, modesty forfend, fans) is a huge accolade. I’m astonished, frankly, that people so much like the work I do just for my own therapy. It sure beats working for the man, even if he is a particularly successful one – but it thrives because I don’t do it for money. Way back in 1991 I invented the pseudonym Deek Deekster as a pun on the great Dex Dexter from Dynasty. 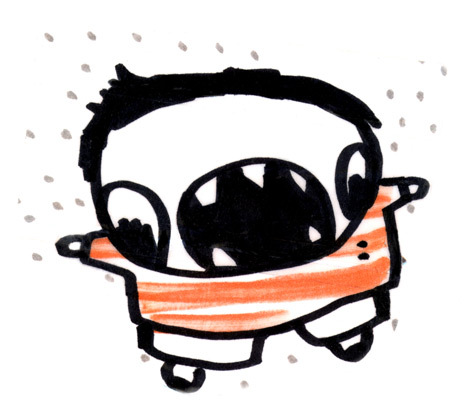 As I began to investigate online communities, I incorporated Deek as an avatar on forums, IRC, MUDs and MOOs. In 2004 I began blogging as Deek and in 2005, I started podcasting. In fact, despite the hilarity of the tag, the first podcast I produced was deeply serious and covered the UK elections 5/5/2005 at http://five.org. But, as podcasting became more established and I began a strange rise to some kind of prominence because of it, I started to become irritated that it wasn’t obvious to other people that there was a separation between Dean (yours truly) and Deek (a work of fiction). In the past year, I have suspended the Deek Deekster Twitter account, ceased to write Blog of Funk (although you’ll find all 800+ posts here under the category “funky original”, deleted or renamed accounts on Qik, Seesmic, 12Seconds.tv, Phreadz, Bambuser and Flickr. This also had a secondary effect of allowing me to create a more meaningful group of online friends to interact with, many of them people with whom I would naturally associate, and I’m really pleased to see that when I’ve met them in real life, the mutual affection and my enjoyment of them as people has been very much present. So, Deek has been languishing, and I had decided that his only outlet was to be Pod of Funk, my non-commercial music podcast. But I had also become frustrated with the fact that my professional podcasting work was denying me the kind of freedoms I feel I need to have in order to make invigorating creative work. Not that I want to venture into cease-and-desist letter mashups like braver friends of mine whose work I truly admire, but grey-areas are important for an artist, boundaries there to be crossed. At LeWeb this year, I listened to Paulo Coelho describing his promoting “piracy” of his own work, consciously pushing against the limitations of strict legality. This is what I need to do sometimes, and without the freedom to make podcasts which do take risks, I am not making work which I would want to listen to, or look at. I’m going to take Pod of Funk forward in 2009 and I have been re-working the podcast so that I can include uncensored and untrammeled material as well as the squeaky-clean podsafery I have been releasing since the beginning of 2007. The way to do it is simple: don’t publish everything to everyone. I’ve been testing a way to use the internet to keep things private and semi-private, just like music and club promoters get the word on the street to the crowd they want to show at their gatherings. It will be interesting to see how successful this proves to be. « Has Blogging Peaked, Or is it Dead?